Certain islands in Greece have their die hard fans and Lesbos is one of them. I learned why when I visited. Locals are fiercely proud of the beauty and history their island owns. This large island in the North Aegean Sea is perfect for nature lovers. Here, you can do anything outdoors from bird watching, hiking, trail running and all types of water sports. Love ancient history? This is the island where the amazing ancient Greek poetess Sappho was born. I also learned a lot at the Archaeological Museum in Mytilene where mosaic tiles from the Roman Era stole my attention. This is also an island of incredible gastronomy. I ate the most amazing cheeses, seafood dishes and mezes — all with local ouzo that goes down easy and light. 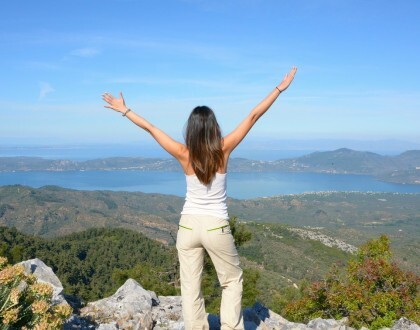 This is the land where ouzo is king! With the migrant crisis, times are tough for tourism here. I assure you it is completely safe. So, don’t let that stop you from visiting. 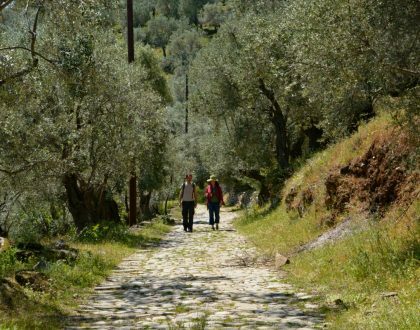 It is a welcoming destination in Greece where you can go off the beaten track, experience authentic travel and make wonderful friends along the way. Lesbos is a special place indeed. 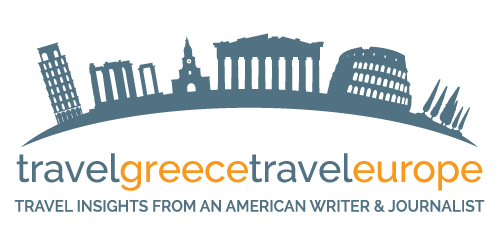 International travelers fly into Athens first, then connect to Lesbos via ferry or a short flight. Check out the best international flight deals on Vayama. There are also ferries that connect with Turkey (1.5 hours). If ferry rides are too long for your taste, another option is to fly. 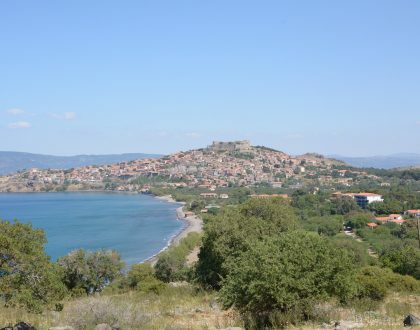 The airport is Lesbos is located right outside of Mytilene Town, the capital. While most charter flights from other European cities are not operating at this time you can find flights on Aegean, Olympic, Astra and more. I flew on Aegean Airlines to get there from Athens. The ride was a smooth 40 minutes. I recommend the Pyrgos Hotel in Mytilene. Housed in a beautifully restored neoclassical building that offers a stay with the island’s unique cultural identity as part of the experience. I had a very nice stay at the Natura Studios in Skala Kallonis. Nice breakfast, pretty garden area and hospitable staff. The location is in the heart of an authentic fishing village, steps from the beach and many excellent eateries. A good home base for day trips around the island, too. 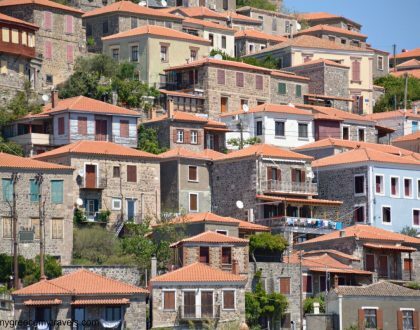 For a quick rundown of all of your options to visit Lesbos check this helpful page put together by The Other Aegean organization. The Lesvos Insider published by the EVA Distillery in Mytlene is another great source of information.